I often forget to empty my Trash, which can grow and grow and grow over time, but this picture shows a bloated trash can being taken it to a whole new level. 489GB! 489GB? What on earth is in there? Huge videos? Giant caches? Old downloads? Zips? Archives? PSD files? ISO images of installer discs? That’s a lot of space, all of these files can consume a whole ton of capacity. 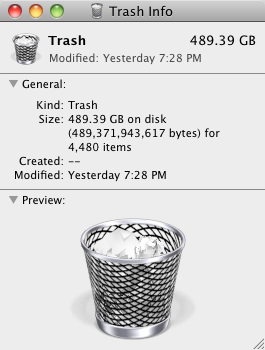 Nearly 500GB of trash alone, that’s bigger than my main hard drive! Time to empty that huge Trash can! This is obviously just kind of here for fun, but this is a legitimate tip: if you’re feeling the pinch for storage, then emptying the Trashcan can often reveal added space that you didn’t realize was being consumed. This happens fairly often to OS X users who may forget to dump their old trashed files so they can sit and linger in the bin waiting to be deleted. Here are some helpful Trash keyboard shortcuts for Mac, and don’t forget to empty your trash, it’s an easy way to free up a whole lot of disk space sometimes. This whopper trash can image comes to us from Marco.org, who seems to have something rather substantial stored in the trash waiting to go! Are you flippyflopping kidding me? Stop trashing my trash, wasting my life with this trash! @Memann That’s quite an overreaction, don’t you think? Agreed. I enjoy these random tidbits every so often. I kinda side with Memann. This isn’t an article, it just some “random crap happening in my day” noise no one cares about, and better posted to Twitter. The post doesn’t even make sense anyway, since anyone with a large drive who’s been doing a marathon of watching downloaded movies or dealing with other large content files, has seen a trash can this full, many times. I have a similar problem, new to OS Yosemite. Just had a SSD and new HDD put in. Am trying to clean out some external drives and trashed 40,000 items. It has taken 3 days to delete 6,300 items. Is this normal? Is there a faster way besides using the Terminal? I am leary to use the Terminal- bad previous experience. No need to be rude if you think this is stupid. Disregard previous post, I stopped the emptying trash process- press option to regular empty trash (unsecured) and it deleted immediately.